For good reason, we focus on Apple events for our daily “Today in Apple history” feature. With that said, Gates stepping down as Microsoft CEO proved an important occasion for the entire computer industry. Born in 1955, the same year as Jobs, Gates achieved his first major success developing software for the original Macintosh. These programs were viewed as so crucial to the Mac’s success that, after Jobs was pushed out of Cupertino, then-Apple CEO John Sculley signed a deal with Gates to give Microsoft “non-exclusive, worldwide, royalty-free, perpetual, nontransferable license to use [parts of the Mac technology] in present and future software programs” for the fledgling Windows operating system. In return, Microsoft pledged to continue developing Word for Mac. The company also agreed to delay porting Excel to Windows for one year. It was a horrendously lopsided deal, as it turned out. And when Microsoft finally got its act together and started making Windows faintly competitive with Mac OS, the agreement triggered a long-running lawsuit over whether Microsoft stole the Mac’s “look and feel” to create Windows. Microsoft came out on top. Throughout the 1990s, the company’s strategy of licensing its technology to third-party manufacturers rather than producing hardware made Microsoft an almost unassailable tech giant. When Apple eventually gave in and tried the same strategy, it backfired — leading to the disastrous “clone Mac” era. Gates and Jobs often found themselves positioned as enemies. However, they were more like rivals. Both got in on the ground floor of the PC industry. And both received media coverage as individuals in a way that a lot of tech execs don’t today. These days, products tend to speak for themselves. 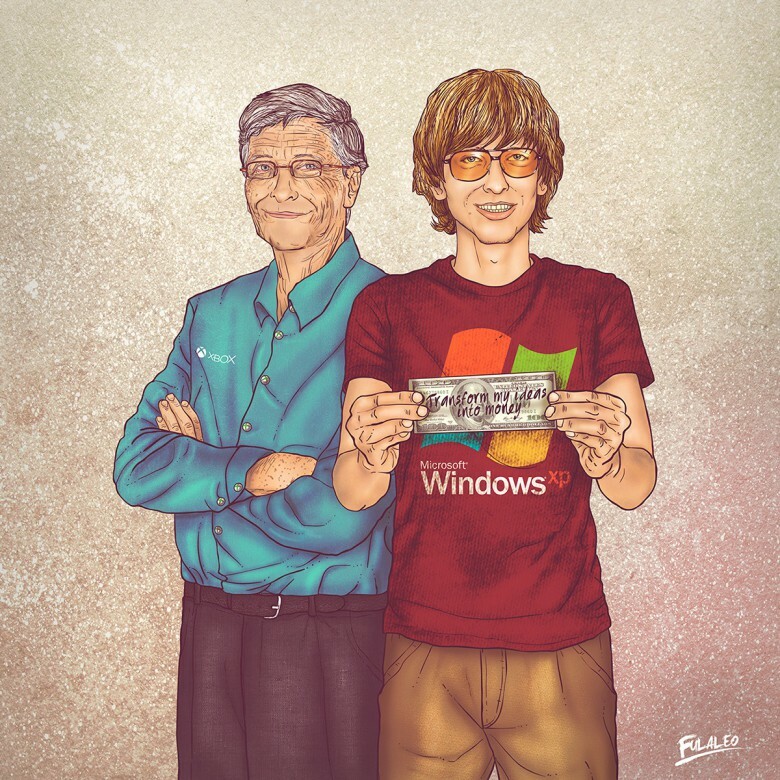 Just nine years before Gates quit as Microsoft CEO, he was riding high. Meanwhile, Jobs was the man running two failing companies: NeXT and Pixar. When Gates stepped down as CEO, he said he would stay on as Microsoft’s “chief software architect.” He gave up day-to-day responsibilities in Redmond in June 2008 to work on his charitable ventures. One possible reason behind his decision to leave his job as CEO: Microsoft faced increased antitrust scrutiny, which undoubtedly made the job less fun than before. Jobs, by comparison, stayed as CEO at Apple until just a few short months before his death in 2011. Were you an Apple or a Windows user (or neither) in January 2000? Leave your comments below.